Running is one of the exercises that you can do anywhere and doesn’t need the gym membership. 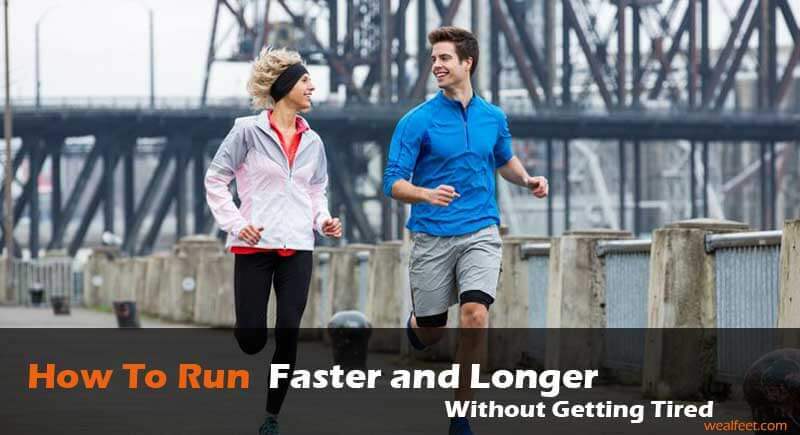 How to run faster and longer without getting tired is a skill that every runner should master. Running is a great way to building strong muscles and keeping your heart healthy. You can also improve your fitness as well as maintain a healthy weight through running. Running faster needs stamina, the courage to soldier on and the will to go the whole distance. What seems like putting on your running shoes and heading out of the front door isn’t a walk in the park. Sometimes your body just wants to quit. But you don’t have to be a professional athlete to master the skills needed for faster and long-running. Goals from our day to day roadmap to success. They enable us to envision the result, without them we don’t achieve our potential. Much as running is physical, I all begin in your mind with a simple ‘I can do this’ thought. You should know the route where you are going to run way beforehand. You also need to pick a route that has less traffic so you can avoid obstacles that will slow you down. You also need to decide how many times you are going to run in a week. Set goals that have personal meaning to you. Setting personal goals to increase your pace and distance with each run feels right. Achieving personal goals will lead to joy and happiness that will lead to well-being. Every goal you achieve will provide extra motivation, not only in running but your life as a whole. Having realistic goals such as running 10K under 1 hour will enable you to push the limits. Knowing the distance, you want to run and what time to do it helps you to focus. After you have managed to run 10K in 1 hour, you can move on to a newer challenge. You can either decide to run the same distance in 48 minutes or progress to 20K in different stages. Setting to run 10K in 48 minutes instead of deciding to run longer and faster is a more specific goal. The more specific it is, the easier it will be for you to succeed. Your goal should have a time deadline. Having a specific date you want to achieve your goal enables you to plan how to reach it. Don’t set out to achieve your goal someday. Chances are it will never happen. Give yourself 3 – 6 months to have enough time to achieve your goal as well as remain motivated. Eating the right meal before a run can help you run faster and for longer. Running requires eating a well-balanced diet that will help you to stay healthy and in good shape to run. A good diet includes lots of fruits, vegetables, drinking a lot of water and steering clear of junk food. You can also eat a light meal an hour before your run. The meals you can eat include baked beetroot, oatmeal, bananas and green tea. This will boost your energy levels and endurance. The warm-up process includes two processes; physical and mental. Get your mind ready for the run. Preparing mentally to run helps to improve technique, coordination, and skill. It also helps to prepare your mind to withstand and endure physical discomfort during the run. A good warm-up activity enhances performances and helps prevent injury. It also helps blood flow to your skeletal muscles as well as opening small blood capillaries. When you run, blood flow to the skeletal muscles increases to 70 – 75% while the capillaries open. More blood gets released into your muscles resulting in better performance. Lack of good warm-up results into muscle tear and can be damaging to your body. Make sure that you warm up for 10 – 20 minutes by stretching your legs before the run. This will enable you to prevent injuries and cramping during the run. A good way of running faster and for long depends on how you start. Start at a slower pace and increase your pace as your body gains rhythm. Remember, you are running a long run and not a 100-meter dash! Make sure you control your breathing pattern. You can start by counting 1-2-3 as you run before you breathe. Keep track of how your body responds as you continue running. Slow down to a steady jog if you experience difficulties. Do not stop right away. Stopping right away can affect you and demoralize you. Running in the rain can make you run faster. It is possible to run faster when it rains because there is no heat exhaustion. You can also push your limits without endangering yourself. It will also help you run faster as you seek to finish your run faster! Music can also determine how fast you can run. You need music with the faster tempo to run faster and longer. Music with a slower tempo has the opposite effect. Wearing the right running gear will enable you to run faster. Having the right gear includes running shoes, shorts, and time-keeping gadgets. Most smartphones have apps that will help you in monitoring your progress. Knowing how to run faster and longer without getting tired takes time. It is something that you cannot learn in a day; it is a steady and gradual growth that requires patience. Start small and build towards your goal of running faster and longer. Celebrate every milestone in your long-term goal by rewarding yourself. Join a running club so you can have a support system. Do not forget to have enough rest to allow your body to get the rest it deserves for continuous performance.